How do I integrate the USA ePay Payment Gateway to my 3dcart Store? This article assumes that you already have an account with the USA ePay gateweay. If you do not have a merchant account, please click here for information about 3dcart's Merchant Account integrated payment solution. 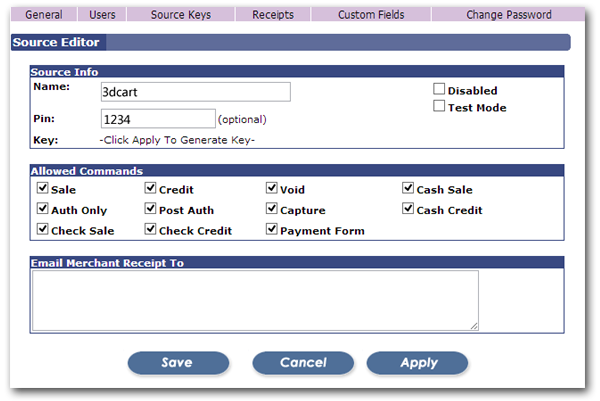 To integrate USA ePay with your 3dcart store, you will need to retrieve a source key from your USA ePay account. The following are the basic steps needed to retrieve this information. *The pin number provides added security for your payment module's source key, but it is optional for the most part. However if you plan to use USA ePay's tokenization system (where you can save the credit card details for future transactions) the Pin will be required. The KEY will be displayed under the source name. Go to Settings ->Payment and click on the "Select Payment" button under "Payment Methods"
Click the "+Add New" button found along the top right of the page. Configure your payment method's ranges and limitations and choose USA ePAY in the Payment Method dropdown. Click +Add to add it. The payment option is added to your store, but we still need to enter your credentials to it and enable it so that it works properly. Type your Key into the SourceKey field. Repeat step 6, and click on the "Test" link to make sure the payment gateway is integrated properly. If the payment gateway is integrated properly - upon clicking the "Test" link - you will see a declined transaction in your USA ePAY account. Along with the settings shown above, you may also notice toggles for Payment module tokenization, Verified by Visa, and Authorize Only. These settings are only to be used when you have the feature available on your payment gateway account or through a separate service. For example, Verified by Visa is a separate service provided through Cardinal Commerce.